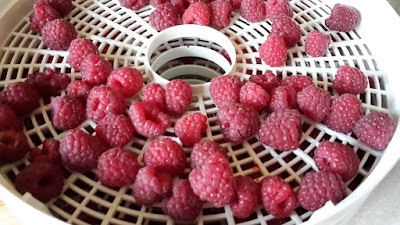 Last year I dried a few raspberries when we had a glut, every time I've used them in my baking they've tasted amazing so this year I've decided to dry a lot more. My little old food dryer is going flat out to try to dry these juicy berries. 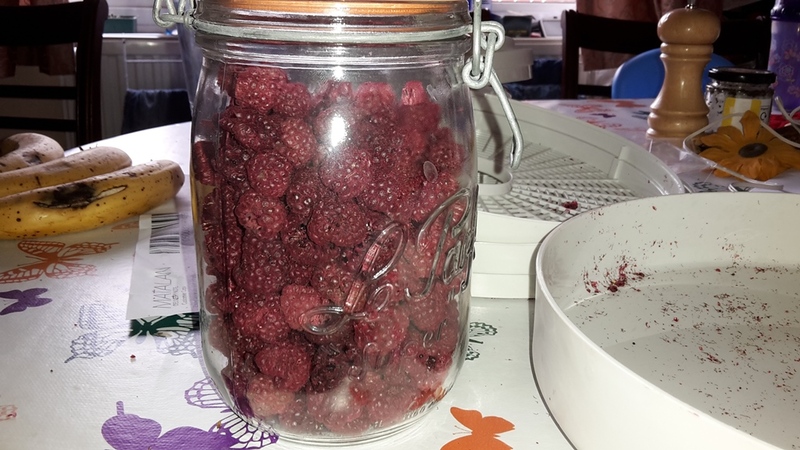 A full punnet (about what I'm picking a day at the moment) dries down to about 3/4 of a kilner jar. 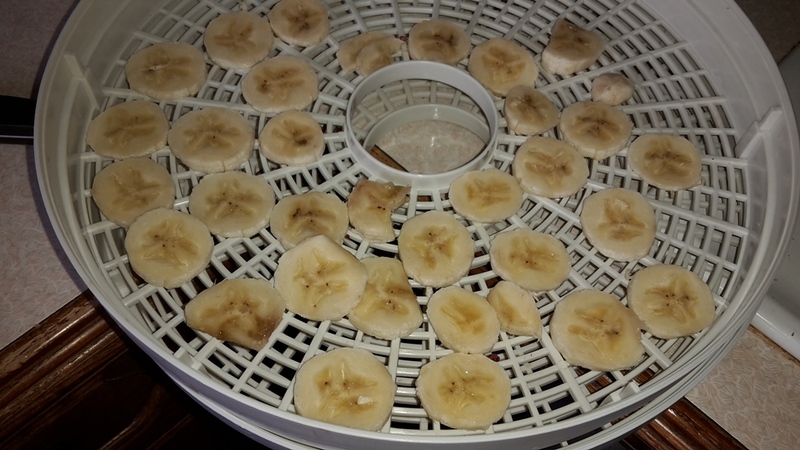 While I was at it I also dried some bananas that had gone past their best (and a few apples on the top layer to fill up space), they make great snacks for the kids and I wouldn't have used them for much else (I didn't fancy banana cake today). My food drier is very basic, just one setting and it's pretty noisy. I was wondering just how good are the more professional models and are they worth their big price tag? I look forward to reading comments, I am thinking of buying a dehydrator and have no idea what make, model or size to buy. Maybe start with a cheaper modle, see if you use it then upgrade. It's a tricky one! I remember you saying and I am tempted because I love the sound of the yoghurt you do in it! 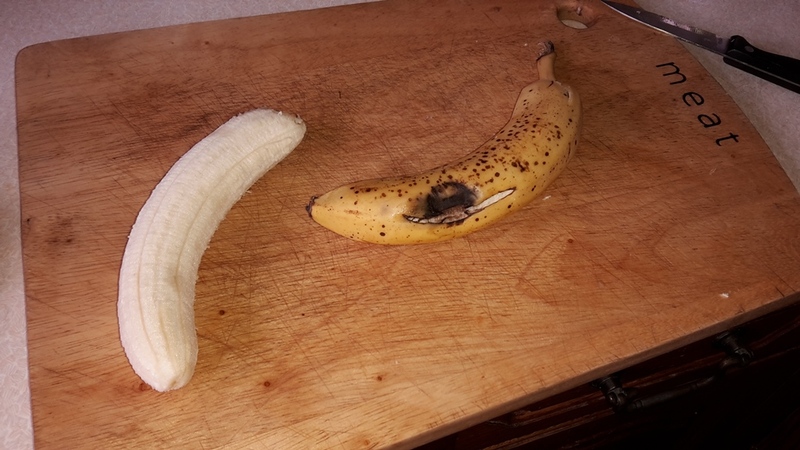 I've never dried food but I'm tempted to start after all the good reports I'm reading about it's longevity once dried. My freezer is full to bursting this year with produce so dried fruit would be a wonderful way of preserving the harvests once all the new fruit trees are in full production. I look forward to seeing which new model you decide to go for. It's a good say to keep more produce and I do love dried fruit. I think I'll be sticking with mine for now as I haven't got any money spare for that type of thing while we're ploughing it into the house! I invested in an Excalibur, which is expensive but is a 'no frills' work horse. By the way you don't need to get the model with the timer, because I did and don't ever use it. It is a plain black box with nine drying trays, and you can get a lot of veg in it. I keep looking on ebay for one and maybe I'll get one that's within my price range. good tip on the timer! your'll have to let me know how you get on with it. maybe it'll go on my Christmas list! Really nice, they won;t last long the kids will eat them in no time! I have not thought to try drying blackberries. I would think if the raspberries are drying up nice blackberries would as well.. mmm will give it a go next season! 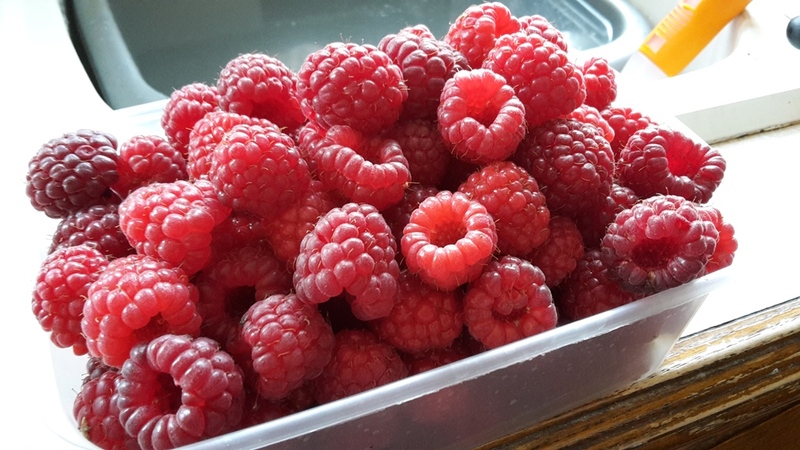 Your raspberries are lovely! I also have an Excalibur 9 tray. Mine has the timer and I use it a lot. But I have a friend who has it without the timer and she is good with hers as well. I tried blackberries one year and they were like bullets, but not sure if I did them for too long. Let me know if you have better luck with them. 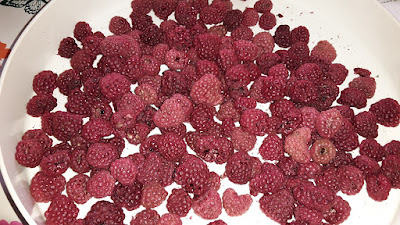 The raspberries are great in cakes and cookies with dark chocolate. We're still getting loads but it's a race against time now until the first hard frost! I've dried raspberries before, they are quite tasty. I have the everbearing kind, which means they fruit once in July and then a second fruiting about now. The previous owners to this house put them in. Only trouble is, our first frost is usually early October, so we almost never get any fruit in the second bearing. This year, I ate mine as they came on, and shared with friends and neighbours. I'll give a thought to drying them next year.